VLC media player which can be used as a server and as a client to stream and receive network streams. VLC is able to stream all that it can read. VLS (VideoLAN Server), which can stream MPEG-1, MPEG-2 and MPEG-4 files, DVDs, digital satellite channels, digital terrestial television channels and live videos on the network in unicast or multicast. Most of the VLS functionality can now be found VLC. Usage of VLC instead of VLS is advised. Complete details of the streaming features are available. To download VLC, go to the VLC download page. To download VLS, you can browse our FTP archive. To download miniSAPserver, you can browse our FTP archive. The network on which you setup the VideoLAN solution can be as small as one ethernet 10/100Mb switch or hub, and as big as the whole Internet. 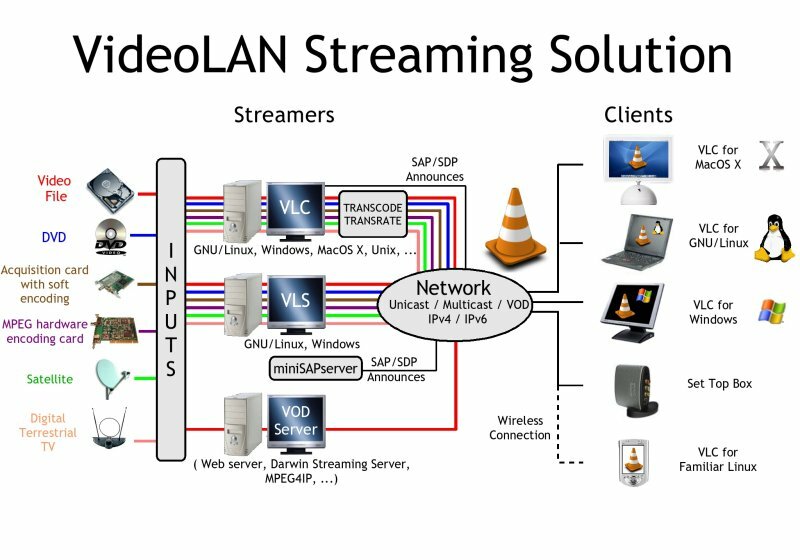 The VideoLAN streaming solution has full IPv6 support. 6 to 9 Mbit/s for a DVD. VLC is able to announce its streams using the SAP/SDP standard, or using Zeroconf (also known as Bonjour).